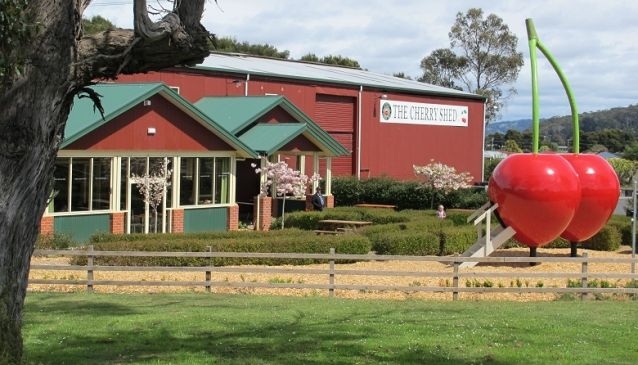 The Cherry Shed on the outskirts of Latrobe has fresh cherries and raspberries to taste and buy in season, many products to buy that use their cherries and raspberries, and serve snacks and meals that utilise their produce. Situated on the Bass Highway, it is hard to miss seeing The Cherry Shed, especially now it has two shiny red giant cherries out the front! Apart from fresh cherries and raspberries in season, they have used their imagination and creative flair to come up with a large array of products that incorporate cherries and raspberries. You will find jams and relishes, chutney and sauces, wines and liqueurs. Extensive use of their fresh produce and products are found on the menu, with breakfast, lunch, morning and afternoon tea being served. You can snack anytime and the pancakes, ice cream and sorbet are always winners. Fruit is processed on site with the cherry season lasting from mid-December 20 to mid-February, with the picking of five different varieties. The Cherry Shed is available for evening functions, with seating for up to 100 people or 150 for a cocktail function. They are also two rooms holding up to 30 people each which can be used for private or corporate meetings. There is plenty of seating inside as well as outside tables. The outside area also has a playground as well as the big cherries for children to explore. Inside there is also a display which includes a cherry pipping machine. For sale are plenty of cherry themed items, such as oven mitts, aprons, umbrellas and bags - you will be amazed what is made with cherries on it! If you would rather a living reminder of your visit, at times cherry trees are potted up for sale, or you can always get them to send you out a couple of hundred raspberry canes, as they are also suppliers of raspberry canes.